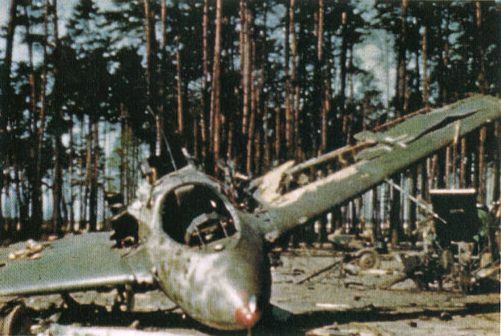 Airfoil caption: Another Me 163B at Polenz which has apparently received similar treatment from the retreating Luftwaffe. This plane is also camouflaged in the late war scheme of Brown-Violet 81 and Dark Green 82. The nose cap is in ROT (Red) 23. note the area of red-oxide primer on the nose, and that the color 81 has been applied heavier on the left nose area. Like the craft shown before, this plane has its wing camouflage applied in a soft sprayed splinter. Unlike the previous plane, however, it has all white wing Balkenkreuse. This may be a plane of one of the operational Staffeln of JG 400. or it might be from one of the two training Staffeln, 13. or 14./ JG 400. Another photo that shows some details of the upperwing camouflage, although large parts of the wing were destroyed. The mottle on the fuselage is quite fine compared to other Komets.